New Delhi: For the first time in 14 years, three Indian institutions led by the Indian Institute of Technology (IIT) Delhi have made it to a list of world’s top 200 universities. The two other Indian institutions in Quacquarelli Symonds (QS) World University Rankings 2018 are IIT-Bombay and Indian Institute of Science, Bangalore. 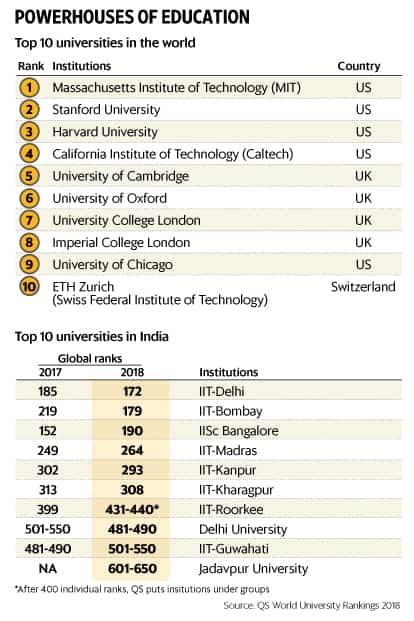 This is the first time three Indian institutions have made it to the list since it started ranking universities in 2004. While IIT-Delhi’s rank rose 13 places from last year’s 172, IIT-B’s rank rose 40 places to 179. However, IISc slipped for the second straight year, coming in at 190, down from 152 last year and 147 the year before. The Massachusetts Institute of Technology (MIT) topped the rankings for the sixth consecutive year. MIT was followed by Stanford University and Harvard University in that order for the second year in a row. California Institute of Technology and University of Cambridge in that order complete the global top five, the UK-based ranking agency QS said in an email on Wednesday. “This year’s results indicate that India is home to three of the world’s top 200 universities for the first time since QS’s inaugural rankings of 2004. Furthermore, IIT Delhi replaces IISc Bangalore as India’s highest-ranked university for the first time since both universities were ranked together," the email said. In total, 20 Indian institutions were ranked—six more than in last year. Of the 14 for whom year-on-year comparisons are possible, five dropped in rank and an equal number improved. Four are stable within bands. The University of Delhi jumped into the top 500, rising from the 501-550 category to the 481-490 category. After 400 ranks, the agency puts institutions into cohorts. “India is progressing in our global rankings. Five Indian universities features among the global 100 for research indicator," said Ben Sowter, research director at QS. In 2018 rankings, though IISc has dropped 38 places, it ranks sixth in the world for QS’s Citations per Faculty metrics meaning its research papers are cited well globally. This metric measures the research intensiveness and research impact of a university. “However, there is still plenty of room for improvement, especially in the employers reputation indicator, suggesting that a closer collaboration between the corporate world and the leading universities is essential. India is also less competitive than other countries in the international students and faculty indicators, which makes perfect sense giving the huge internal demand for higher education," said Sowter, adding that India’s top institutions will gain further ground, “gravitating steadily towards the Top 150".